With The Grand Design, Austria's Edenbridge crafts a luscious and sparking concept album, one that builds upon and concurrently transcends the neo-classical power metal the band is renowned for. Yes, the power-metal guitars, bombastic musical structures, elegant keyboard washes, and suspiria-driven vocals of Sabine Edelsbacher are all on display, but on this outing mastermind Arne 'Lanvall' Stockhammer (guitars and keyboards) creates a splendid spectacle filled with the hope and joy often disdained by the metal community. Terra Nova sets the stage with a summary of cosmology: life is circular, with souls sent to acquire experience and wisdom upon new lands. Death is a great mystery, but at journey's end Eden is revealed, the essence of which welcomes home each weary soul. Flame Of Passion sounds a bit like modern Nightwish in its structure, and as a result it is one of this effort's weakest compositions, but then comes Evermore, a song driven by some heavy power-metal guitars and Sabine's straightforward delivery while lush strings and keyboard stings ebb and flow through the song. The Most Beautiful Place is an enchanting piano-driven ballad, minimalist in execution but nevertheless powerful and affecting. The song is also perfectly positioned on the CD between two heavier, crunchier pieces. See You Fading Afar starts off with a rollicking guitar riff nicely shadowed by bassist Frank Bindig - the crescendo quality of this composition works well, particularly when it reverts upon itself during some neo-classical noodling that serves as the song's principal bridge. On the Top of the World is a quirky and poppy number, the poetic stanzas flowing nicely and the instrumentation following suit - another weak track with respect to the collective, but it has that 'single' sound and works well as a standalone composition. Taken Away is another piano-centered piece, this one moodier than its predecessor (and, as it turns out, is my favourite track). Closing out the concept album is the 10-minute title track, which brings with it another monstrous guitar riff, some effective six-string hooks, and a very sensual performance from Sabine. Halfway through the opus, the band suddenly gets a little folksy, and the performance is extremely effective. This is something Edenbridge should explore more. The Grand Design comes with two bonus tracks. The first, Empire Of The Sun, is an instrumental whose guitar riff is seemingly inspired by the great David Gilmour and driven by the likes of Joe Satriani. The second is a cover of For Your Eyes Only, originally performed by Sheena Easton for the James Bond flick of the same name. Although the band turns in a solid performance, especially Sabine, the track is a little out of place here. Those of your interested in being immersed in the concept album would do well to skip it altogether. 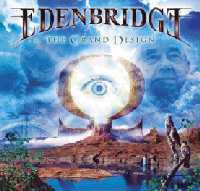 Fans of Angra, Rhapsody, Nightwish, and even Ayreon probably already know about Edenbridge. Those of you turned off by the harsher facets of heavy metal should really check out this band - they have a distinctive sound you will not soon forget.